The Black Cow is Westlake Academy's Student Newspaper, let by Grade 4 Teacher and WA alum, Sarah Titus. 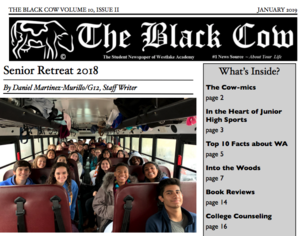 As a student, Ms. Titus was a writer for the Black Cow. Now, she leads a group of students keeping this time honored WA tradition a favorite among staff, students and families. Read the latest edition here.